Ryan Hagan was a 3-year letter at North Gwinnett High School and graduated in 2012. He went on and played 1 season at Presbyterian College out of High School, but then transferred to Chattahoochee Valley Junior College in Alabama. He was the conference player of the year, Juco All-American, and a starting member on the JUCO All-World Series team. 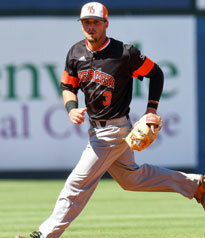 He then transferred to Mercer where he started at second base his Junior season, and Shortstop his senior season. He was the Southern Conference Player of the Year his senior season at Mercer and the starting Shortstop on the All-Conference team. He lead his conference in Stolen Bases in the regular season, and finished 7th in the country in Stolen Bases with 24. Out of his 4 seasons in College his team has won 3 conference championships, and he started in every game each season. Ryan looks forward to passing down the baseball knowledge he has learned from the great coaches he has learned under, and from his experiences as a recent player.